Orbital ATK is targeting Saturday, Nov. 11 for the launch of its Cygnus spacecraft on an Antares rocket from pad 0A at Wallops Flight Facility in Wallops Island, Virginia. • Elwood Agasid, deputy program manager of the Small Spacecraft Technology Program at NASA’s Ames Research Center in Silicon Valley, California, will discuss two missions, Integrated Solar Array and Reflectarray Antenna (ISARA) that will demonstrate increased downlink data rates for CubeSats, and Optical Communications and Sensor Demonstration (OCSD) that will be the first demonstration of space-to-ground laser communications with CubeSats. • Stevan Spremo, project manager for E. coli AntiMicrobial Satellite (EcAMSat) at Ames, will provide an overview of an experiment to study spaceflight effects on bacterial antibiotic resistance and its genetic basis. • Matt Zymet, executive director for Advanced Formats at National Geographic, will provide an overview of a virtual reality project that brings footage for a program that teaches viewers about the breadth and depth of Earth and Space. • Michelle Lucas, founder and president at Higher Orbits, will discuss the Go For Launch! program and one of the winning student experiments that will study the role of nitrogen on the growth of Microclover, a resilient and drought tolerant legume, in microgravity. 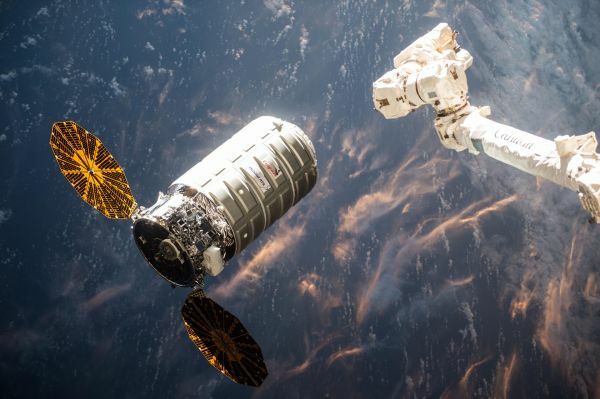 The Cygnus spacecraft will carry crew supplies, scientific research and hardware to the orbiting laboratory to support the Expedition 53 and 54 crews for the eighth contracted mission by Orbital ATK under NASA’s Commercial Resupply Services contract.